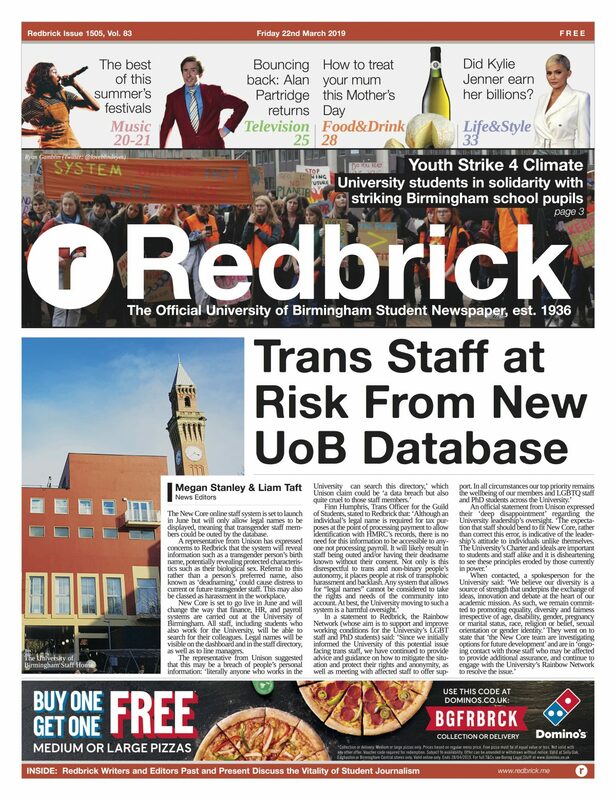 This article was originally published in October 1930, in that month’s edition of ‘The Mermaid’, a student publication that preceded Redbrick. It has been reprinted with the permission of the Cadbury Research Library. The piece’s original author, H. W. Hobbiss, was the architect responsible for the original design of the University of Birmingham Guild of Students building. The problem that confronts an architect when commissioned to prepare plans for a building can be compared to a mathematical formula - the component parts being the known element, and the building itself being the unknown. The correct result depends on the accuracy of the construction of the formula. But, whereas the mathematician may test and prove his formula by solid experiment and arrive at definite conclusions, the architect may find his formula overloaded with extraneous matter. The human mind has not been standardized. We may all want the same things, but we express our wants differently. An architect, then, has to be something of a psychologist. The mind being so much greater than the matter, he may find himself confronted with conditions that cannot form themselves into material fact. The more he leaves in, his problem will be more difficult, and the final result will be less satisfactory. Furthermore, he has to become, especially in the first stages, a sort of medium, influenced by all kinds of currents and cross-currents. But, he must be a conscious medium with power to reject undue influence and modify suggestion. It may be that he has a problem such as the Undergraduates Union. The first influence that he would find would be that of the Union Commission. An energetic and efficient body of bright young people who spread themselves North, South, East and West, and collect valuable data varying from the area of Debating Halls to the menu of 1/6d lunches. This survey resulted in a report and contained definite information which your architect doubtlessly found highly valuable: he was able to make deductions and construct more than one part of his formula. But here again, he must have had to be careful when he found he would have to provide a Debating Hall about 200 feet long and 45 feet wide, a building similar in dimensions to the famous Trajan Basilica. It is not to be wondered at, threfore, that he wandered off on his own account, in company with the Secretary of the University, to bear witness to some of these Undergraduates Unions. It is also a fact that he confined his attention only to Universities north of Birmingham. There is evidence that much was seen in these few days, and from nebulous matter the plan began to take concrete form in his mind; so much so, in fact, that in a few weeks he was able to prepare lantern slides and to show to the Union Committee not only the plans of the buildings that were visited, but a preliminary plan of the building much as it was finally built. The plan showed the principal accommodation on three floors. The lower ground floor provided for Cloak Rooms, Lavatories, Baths, Dressing rooms, Stores, etc. The ground floor provided for social, clubbable accommodation, such as Billiard rooms, Writing rooms, Reading rooms, Common rooms, Entrance Halls, Tea rooms and Buffet. The first floor provided the Ceremonial accommodation with its wide corridor, and its Debating Hall and Gallery, the smaller Hall, etc. Here also will be found the nerve centre of the organisation, the Union Council room and the Union Offices. There is another floor devoted to the important provision of the Union Kitchen, the Caretaker, more Committee rooms and offices, and lastly the Property room – a cave-like place devoted to the mysterious activities of the Dramatic Society. There are three principal entrances: the one to the East is for Women Undergraduates, the one to the west for the men, and the Central Entrance on the North for men, women and visitors. The East wing can be regarded as providing exclusive accommodation for the women, whilst the West wing was reserved for the men; the centre of the building is common to both. So much for the plan. 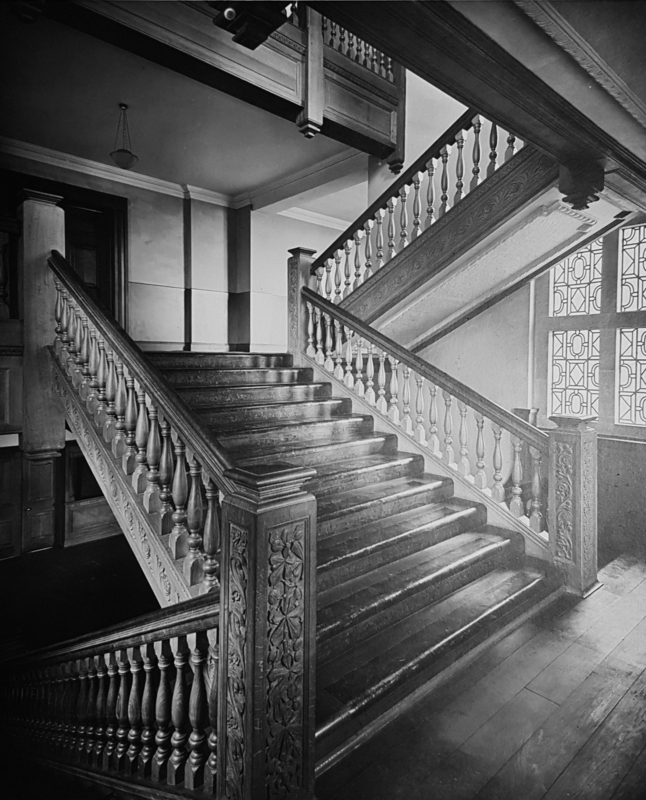 The Guild of Students main staircase, photographed just before its opening on October 15th, 1930. However, your architect may be helped, advised and coerced by his Committee as to the plan; he may throw off the influence of purely scientific consideration and soar into the rarefied atmosphere of art as expressed by the shape, craftsmanship, detail and finish, when he comes to consider the elevations. It can well be supposed that with the example of a distinguished architect’s work so near, whose style is strong and distinctive, he might have felt some diffidence in departing from the example set before him. It should, however, be remembered that the purposes and character of the two buildings are different. The one is entirely devoted to the uses of education, and the other is for domestic use. The scale of the buildings is so different. Had a style similar to the University been followed, the result would probably not have expressed the intention for which it was built - it might have been mistaken for a Library or Museum. Moreover, a peep behind the Union President’s chair revealed a still-higher authority: the University Council, a body of Olympians, sage, benign and considerate, but ready to hurl thunderbolts on anything which did not add to the dignity and reputation of their University. Here was a force which must have greatly influenced the architect; in fact, they laid down that the materials used in the elevations must be brick and stone. This provided him with another part of the formula. Now there are two beautiful buildings of this material in the vicinity of Birmingham, Aston Hall and Castle Bromwich Hall. They are both domestic in purpose and dignified in appearance; and, moreover, they are thoroughly English. They were erected during that period of English history which was particularly associated with the advancement of Education; so much so that most of the Colleges of the older Universities and the Public Schools in England were erected within a hundred years of their date. Here was the source of inspiration. The plan was therefore clothed in the raiment of our forefathers with a few modern touches added when required. A model of the design was submitted to the Olympians and all the lesser authorities; this, too, was passed. Then came the greatest consideration of all – the cost. Apparently, there was no difficulty about that, for the building as complete is line-for-line in accordance with the original design. For the rest, credo experto, go and see for yourselves. There is no space to tell how the heat is generated or how the foul air is removed. There is no space to tell of the vacuum which is to extract the dirt; or of the targets of gold, silver and precious metals; or the oak timber from Bagshot Woods; or the teak from India; or the tint of the tea-cups; or the cunning selection of fabrics; or the beer engine, the buffets, the stage contraptions with its dimmers and its lighting controls. These and many other things are there to be seen. The formula, in fact, has been worked out and the result standing at the corner of Edgbaston Park Road and University Road, to be known henceforth as the Guild of Undergraduates Union.